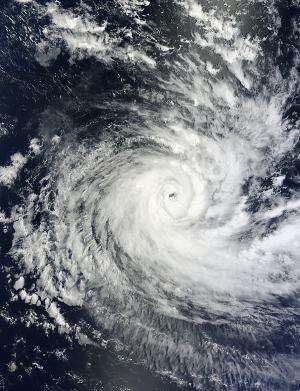 Tropical Cyclone Anais, the first tropical cyclone of the Southern Indian Ocean's tropical cyclone season, has strengthened over the weekend of Oct. 13 and 14 and by Oct. 15, the storm was packing sustained winds near 100 knots (115 mph/185 kph). The Moderate Resolution Imaging Spectroradiometer (MODIS) instrument aboard NASA's Aqua satellite captured a visible image of Tropical Cyclone Anais off Madagascar on Oct. 15 at 0940 UTC (5:40 a.m. EDT) and revealed an eye. Multi-spectral satellite imagery showed that convection has continued to decrease around Anais' ragged eye, indicating that the storm may be weakening. On Oct. 15 at 1500 UTC (11 a.m. EDT) Anais was 650 nautical miles (748 miles/1,024 km) northeast of La Reunion, and has been moving to the southwest at 8 knots (9.2 mph/14.8 kph). Over the next several days, Anais is forecast to move past La Reunion Island, while the center of the storm stays to the north and west of the island. As the storm moves further southward, it will move into waters below the 80 degree Fahrenheit (26.6 Celsius) threshold needed to maintain the system. In addition to the cooler waters wind shear is forecast to increase, so Anais is expected to weaken over the next several days.